HUBER+SUHNER as a leading global supplier of RF product is an active partner of a developing group designated to provide an innovative solution for the telecom market. 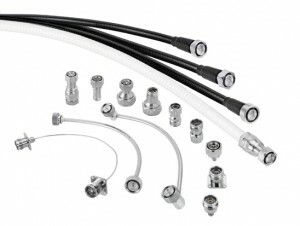 The new 4.3-10 connector system is designed to meet the rising performance needs of mobile network equipment and at the same time reducing its size supporting the ongoing space reduction requirements. The interface design has been filed to IEC and has the potential to become the standard connector system for the above mentioned market. This new interface offers very low PIM performance together with weight and compactness advantages. A key feature of this connector is the separation of electrical from mechanical plane, which implies a PIM and RL optimized contact independently from the coupling mechanism. This characteristics gives the possibility of offering the connector plug with screw, hand screw and quick lock design, thus simplifying the installation effort and offering for all mechanisms a very high electrical performance.